Are you looking for a simple and elegant dessert? Then here it is - Grilled Pineapple. 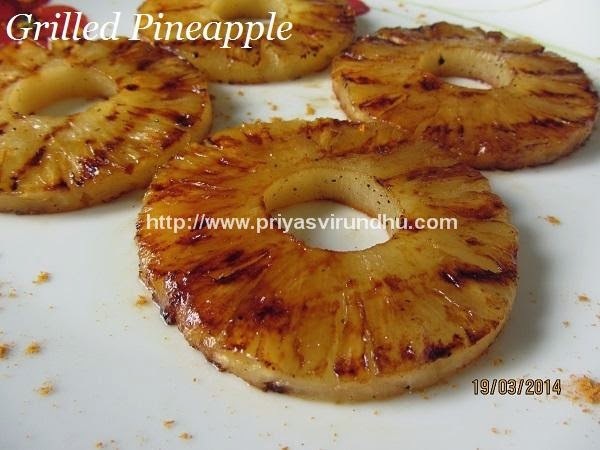 Grilling the pineapple, ties together the natural sweetness of the pineapple along with caramelized sugar of the applied glaze along with mild spiciness of the black pepper powder. This Grilled pineapple, is a perfect crowd pleasing exotic dessert. I have already posted Grilled Eggplant salad and Grilled Chicken –Indian style, to continue the theme I have come up with Grilled pineapple. Do try it out friends and post your feedback. Grilled food has become a trend in Chennai; I come across lot of people who go in search of best restaurants for grilled food. In my last post I did share a Grilled Eggplant Salad for vegetarian lovers and today I am going to share the Grilled Chicken with Indian masala for chicken lovers. This grilled chicken is so easy and is a best proof that anybody can cook. 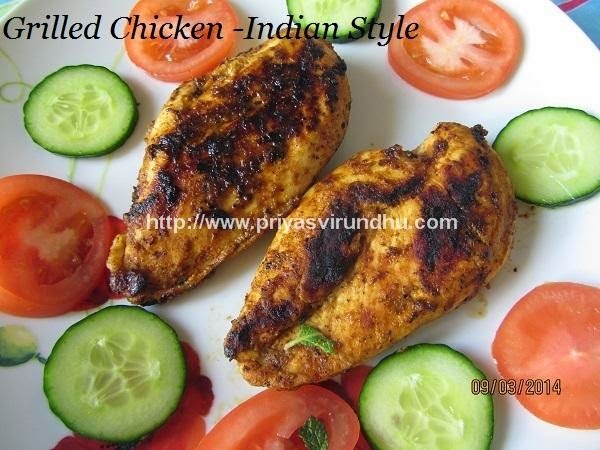 This grilled chicken is one of the best party foods, when you have to feed large crowd. And also, it is my treat for the bachelors who have been requesting me for some easy and hassle free chicken recipes. Do try it out friends, this chicken will surely loot your heart and the taste will linger around your mouth for a very long time. Today I will be sharing with you all a very vibrant, colourful and exotic Grilled Eggplant salad. I came across this recipe in Master chef South Africa and fell immediately in love with it. Anything healthy, quick and easy to make, then I try it right away and believe it or not this salad is surely mind blowing.